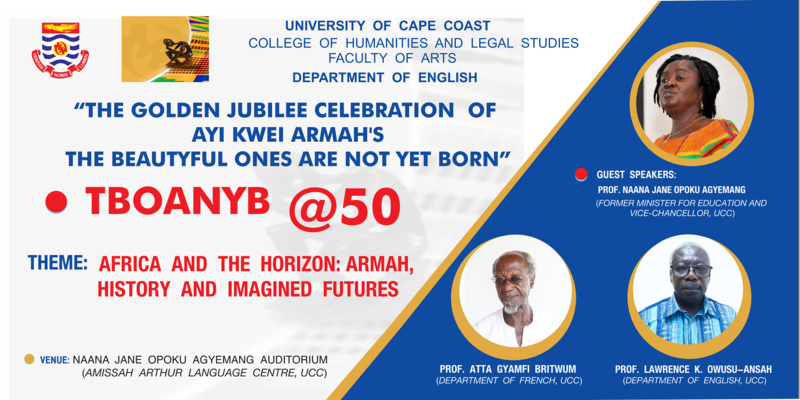 THE GOLDEN JUBILEE CELEBRATION OF AYI KWEI ARMAH'S "THE BEAUTYFUL ONES ARE NOT YET BORN"
The Department of English, Faculty of Arts, College of Humanities and Legal Studies, will hold a One-Day Conference to commemorate the 50th Anniversary of the publication of Ayi Kwei Armah's novel "The Beautyful Ones Are Not Yet Born". The Conference is on the theme: "Africa and the Horizon: Armah, History and Imagined Futures". The Conference will start with an Opening Ceremony at 9:00 a.m.